August 8, 2013 February 10, 2016 ~ Sara W.
When I was 19, I made a bucket list of 100 things I wanted to do before I died. I’m not sure if it speaks to my lack of ambition, but I only came up with 70 items for the list. I lost the list over the years. Then again, at the age of 24, I decided to make a new list. This time I would only have 50 items. I remember reaching 50 too quickly, but running out of the space I allotted in my journal for said list. At the time, I stuck with 50 even though I dreamed of more. We have 26 days left of summer. I am happy to report that there are only 18 items remaining on our list. I’m not so happy to report that Microsoft Word does not recognize S’mores and pedi as real words. How is that possible? I suppose I get pedi, but S’mores? Really, Microsoft? You’re as bad as Scotty Smalls in The Sandlot. So many of the fun things we did this summer were a direct result of the inspiration and motivation of this list. 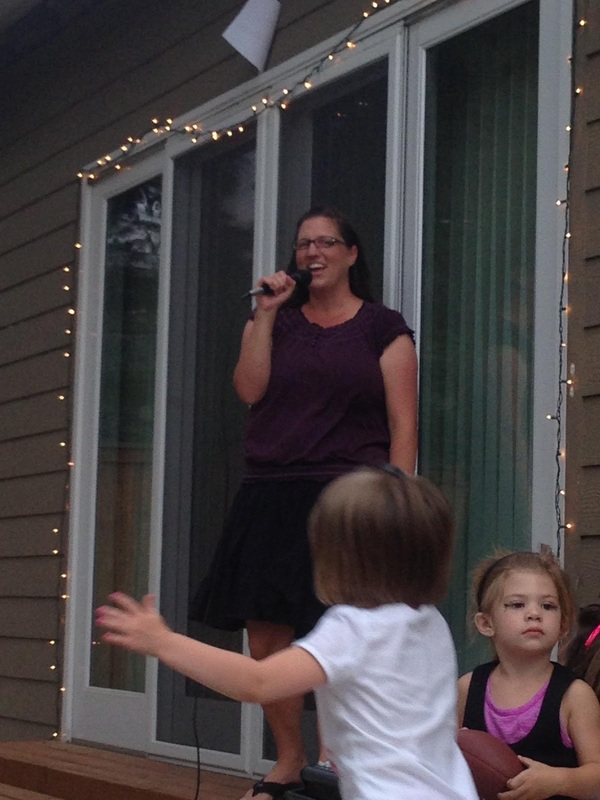 One of my favorites of the summer was our Throwback Talent Show. Back in the Spring, a couple of my friends and I had discussed how fun it would be to hold a talent show where the adults had to do talents that they did as a kid and the kids got to do whatever they wanted. Honestly, I don’t think it would have come to pass had it not been on this list. Isn’t the excitement of checking something off a list worth the time to plan and coordinate an activity? Sure, I humiliated myself by singing Bette Midler’s “From A Distance,” but it was well worth it! It was a blast to see everyone else’s talents and to just have some good ol’ fashion fun. I will say though that in hindsight, I wish I had chosen a cooler song in my youth when I sang in the talent show in the fifth grade. Everyone that attended said that they had a great time, which is always nice to hear. The thing is that the whole endeavor was super easy. I stressed out a bit worrying whether or not it would turn out okay. That’s part of my nature. I’m a stressor. Other than the unnecessary stress I put on myself, it was a piece of cake. Yet it would not have happened had it not been on that Summer Bucket List. So to you, dear bucket list, I thank you. 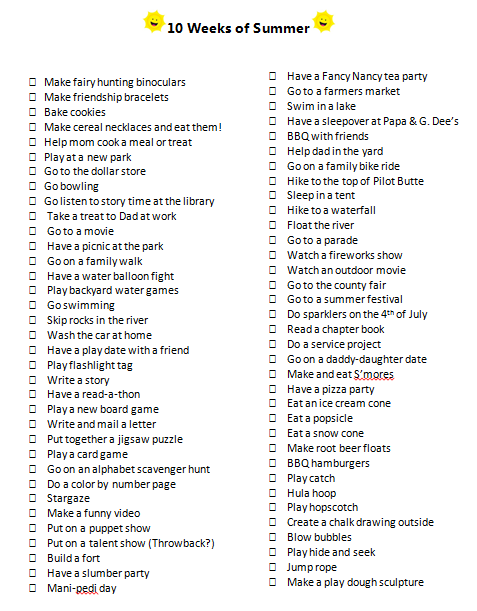 To my friend who was motivated enough to make the original lofty bucket list for her kid’s summer, I thank you. I have had the best summer of my life thanks to this list. I’m sure it helps that my new hometown is a vacation destination for most. Seeing the power of our Summer Bucket List made me ponder my Life Bucket List. I’m now 32 years old. I know where my 24-year-old bucket list is, but I want to revise it. I made that list based on things that I thought I wanted to do. I made it based on what I wanted to accomplish so that I could be as talented as others that I was constantly comparing myself to. For example, I had on there that I wanted to learn how to sew. The truth is that I don’t like sewing. I wanted to sew since I admired, translates as envied, what other woman could create. So, sewing goes off the list. But I keep on my list watching the TV show Saturday Night Live live, eating Italian food in Italy, and going horseback riding. Plus, I get the satisfaction of checking those items off like riding on a Zamboni and watching the sunrise on another continent that were on the original list. Go ahead, make your own bucket list! It’s not too late! Make it all yours! It’s a powerful thing and it’s never too late to begin! It was the awesomest EVER. What a fun night and great inspiration to get going on my own bucket list. I have never formally written down anything for a bucket list — ever. Sure, I have vague ideas floating around in my brain (sometimes rational thought does occur!) of things I’d like to do, but I’ve never made it a tangible list of goals to accomplish. I need to do that! Otherwise, it’s too easy to get lost in day-to-day life and forget about those things we really want to experience. I turned 35 last month. Life is going by WAY too fast.